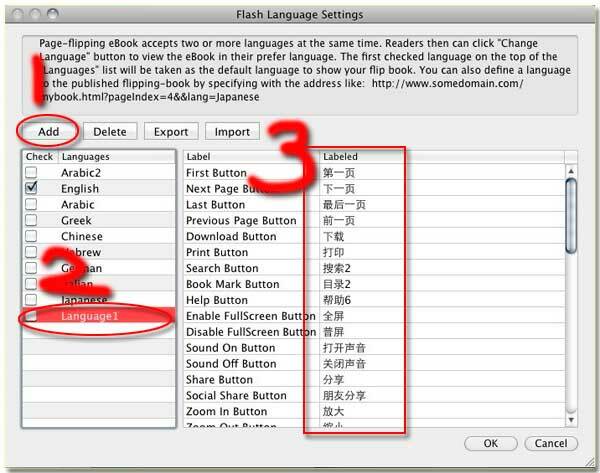 Can I add my native language to FlipBook Creator for MAC to replace English? You can replace the default English with your native language or the language which most of your readers speak. It brings many benefits for you because it facilitates reading process of your perspective readers. If you are not so familiar with English, you could try to modify the English explanation to your own. It is very easy but can attract more attention for its careful consideration. Step1: you have to find out the option of Language on the left settings list. Step2: click it to open the language adding window, click the button add and then name the new option in the left list. Step3: compare with the left list of English explanations, you can define the new language ones. Note: which kind of language in the list do you want to be the default display? You can tick off it and then the checked language will become the default as the initial.